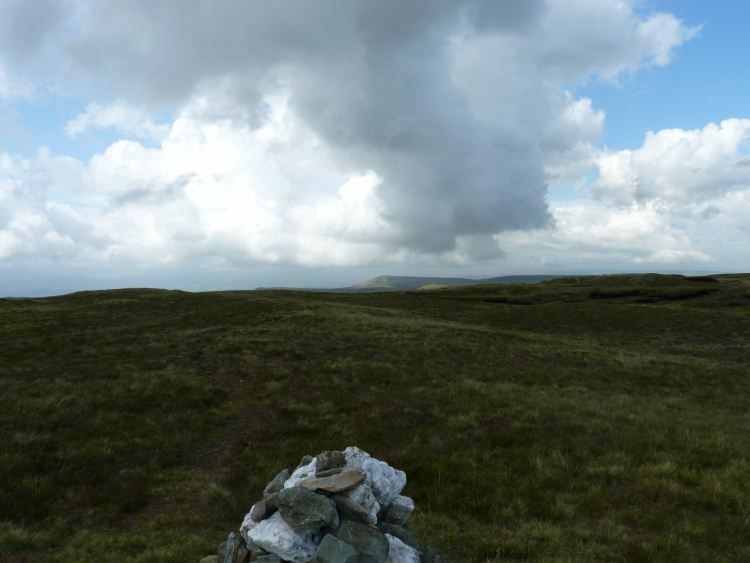 This circular walk takes you to see the source of the river Wye and the river Severn. 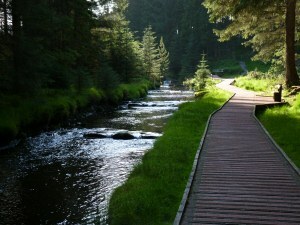 It begins in the Hafren Forest until you reach the boggy side of Plynlimon which gives birth to the Wye. You then descend into the forest again, and traverse the side of the mountain until you reach another boggy ascent to the start of the Severn – with wonderful views over the Welsh Mountains, the west coast, and the Snowdonia peaks. The return is along a lively and beautiful young Severn. Grade: Moderate – Gradual climbs on first part of walk (with a couple of steep short sections), but a steeper stony descent in the last part. 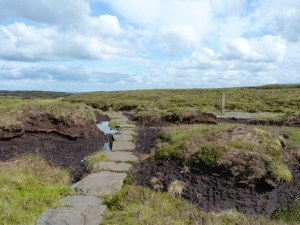 The spur up to the source of the Severn has stones across bog in some sections, and these are mostly OK – but a few have sunk and you need to use tussocks of grass to get across the gaps. Park at the Rhyd-y-bench car park in the middle of the Hafren forest, north west of Llandiloes. From the car park walk towards the toilet block and then go left of this to follow the Wye Valley walk, which will take you all way all the way to the source of the Wye. We found the colour coding of walks shown on a map in the car park very confusing , and you are best looking for the little round badges indicating the Wye Valley walk. Anyway, having gone past the toilet block you will find yourself on a red marked boardwalk, with the river Severn on your left hand side. Continue to follow the Wye Valley walk symbols, and when you reach a wooden bridge over a stream you continue to follow the Wye Valley walk towards the left ( the Severn Way – and the infantile river Severn- go off to the right and this is the way you’ll be coming back). The Wye Valley walk continues to follow a tributary of the Severn (Afon Hore) up a valley until you go left over a concrete bridge. Continue following the Wye valley walk symbols, and you will emerge from the trees into a more open area, and finally find a path signed on your right hand side, for a view of the source of the river Wye. Once you have gone up this and identified the beginnings of the Wye, as well as admiring the views, you need to retrace your steps. 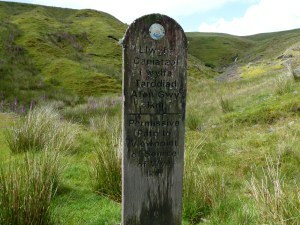 You will return on the same path to the concrete bridge over the Afon Hore. Once you have gone over the bridge you will see a path up, about 10 yards along on the left hand side. Take this, going past a small wooden workmen’s hut. You have now left the Wye valley walk, and are following a link path, which is indicated by a white ring on wooden markers. You go past mine workings, a waterfall, lots of uprooted trees, and some fantastic views, until you meet the Severn way. At the junction of the paths, you turn left keeping the embryonic river Severn on your left hand side. When you have reached the source of the Severn – a watery oozing from some bog, it is worthwhile continuing straight ahead on the stone path and over a stile. You will see some fantastic views towards the coast, and on your right are the mountains of Snowdonia. Retrace your steps until you get back to the junction of the Wye Valley walk and Severn Way, and then cross over the Severn, turn left and follow the Severn way path down. The dark waters of the young Severn tumble through a steep and verdant valley, which you follow until you meet a track where you go right in front of the Blaen Hafren falls. After a few yards you turn left to continue your descent of the valley. Continue following the Severn way symbols until you find yourself walking along the red boardwalk on which you started your day, and this takes you back to the car park. The parts of this walk which took us under trees, were characterised by an abundance of moss and lichens. I don’t think I’ve ever seen so many lichens in one place. Underneath the trees there were waves of fat moss. I think that the underlying waves must have been formed by needles being dropped at particular times of the year or in particular conditions, and then the moss has grown on top of it. Each wave was about 18 inches deep, but when you pressed it it was amazingly compressible and springy. The almost permanently damp nature of the land here shows also shows itself on the path up to the source of the river Severn (and – needless to say at the source itself!). On your right hand side there are some very odd peat structures, which look almost like heather islands thrusting up from the underlying bog. The other thing of note in the forested areas was the number of pairs of jays. It’s difficult to know whether we were seeing a couple of pairs over and over again, but we did cover quite a large area so this doesn’t seem very likely. We counted eight different sightings during the day, as well as lots of finches, buzzards, kestrels, and a very unwieldy heron making its way home in the evening.